Christian Democratic Union CDU party leader and German Chancellor Angela Merkel reacts on first exit polls in the German general election (Bundestagswahl) in Berlin, Sept. 24, 2017. Angela Merkel has won a fourth term as Germany’s Chancellor in a federal election whose outcome seemed inevitable since the start of campaigning three months ago. But her ruling Christian Democrats got a lower share of the vote than predicted and Germany’s far-right populists surged, securing a bigger vote than most pollsters forecast. Official results give Merkel’s ruling Christian Democratic Union and its Bavarian sister party, the Christian Social Union, a 33 percent share of the vote, making her one of only three postwar chancellors elected to a fourth term. Pollsters had expected the CDU/CSU to win between 36 to 39 percent of the vote. With the lower CDU vote and a stronger showing than expected by Germany’s controversial far-right populist party Alternative for Germany, Merkel’s win is arguably bittersweet. "We fought for Germany that lives happily and well," Merkel said at the CDU headquarters. But she acknowledged "a new challenge in the form of the AfD," adding, "We would like to win back AfD voters so we will look into their concerns." AfD easily cleared the five percent threshold needed to secure seats in the Bundestag. Merkel is blamed indirectly by some in Germany for the rise of the AfD, which until her 2015 open-door policy for war refugees from the Middle East appeared to be moribund. AfD grabbed 12.6 percent of the national vote, the first time openly nationalists have entered the German parliament since the Nazi era, marking a sharp departure for a country that has limits on political speech and is wary of any dramatic expressions of nationalism. AfD top candidates Alexander Gauland, left, and Alice Weidel celebrate with their supporters during the election party of the nationalist 'Alternative for Germany', AfD, in Berlin, Sept. 24, 2017. Merkel’s win can be seen as a personal triumph for her, despite the emergence of the AfD. She acknowledged Sunday night it had been "a difficult campaign." Two years ago Merkel’s political position appeared much more precarious with the country turning against her immigration policy and resentment building up over her handling of the debt crisis in southern Europe and increasing social inequality in Germany. Her poll ratings recovered as the refugee influx ebbed and Donald Trump won election in the United States. Some CDU insiders say the “Trump factor” helped Merkel, as did last year’s Brexit vote. After the political disorder in London that’s followed Britain’s vote to leave the European Union and turmoil in the United States in Trump’s first months in office, Germans appeared to be in no mood to gamble, voting for things to remain as they are - stable and, for most Germans, affluent. The performance Sunday of Merkel's main center-left challengers, the Social Democrats, junior partners in the outgoing governing coalition, was worse than they had feared. With just 20.5 percent of the vote it was the party's worst post-war showing. The AfD will now be Germany’s third largest parliamentary party and their performance will complicate Merkel’s decisions about who to form a coalition with to govern the country. 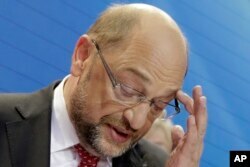 Speaking to party members in Berlin, Social Democrat leader Martin Schulz ruled out forming a coalition with Merkel. “Today puts an end to our cooperation with the CDU,” he said to cheers. In recent days Merkel had indicated she favored shaping a different coalition, if for no other reason than to avoid the AfD becoming the official opposition in the Bundestag. Being designated the official opposition would give the AfD parliamentary privileges Germany’s other parties would prefer to deny it. Merkel will now start negotiations with the revived pro-market Free Democrats, who failed to secure any Bundestag seats in 2013 but made a comeback in Sunday’s election, and the Greens, in an arrangement being nicknamed the "Jamaica Coalition" because of the parties’ colors reflecting the national flag of the Caribbean island. But negotiations are likely to be tricky and could be drawn out for weeks, if not months. Both parties have recently formed coalitions with the CDU in two regional governments, but the Free Democrats do not see eye to eye with the Greens on national issues, particularly immigration policy and on the European Union. The Free Democrats are opposed to greater EU political integration and centralization, something Merkel has endorsed and so, too, the Greens. On the AfD’s performance he said: “this is not at all what we wanted. But to say everyone in the AfD is a Nazi is not correct, some are conservatives, and we could see the party split.” He still held the possibility of Merkel forming a coalition government with the Social Democrats, saying that to form one with the Free Democrats and the Greens will be very difficult.